Home Other News What’s the point of Pamplona? What’s the point of Pamplona? TRAVEL SPECIAL: James Bryce takes his life in his hands at the celebrated Running of the Bulls in Pamplona and discovers there is plenty more to the region than the drink-fuelled revelry suggests. THE air fizzed with nervous tension in the narrow, high-sided streets, made ever more claustrophobic by the hundreds of spectators who filled the overhanging balconies. It was an atmosphere like nothing I’d ever felt before, like being in a bear pit. It was then that it dawned on me what I was letting myself in for. After a night of partying and excess in Pamplona’s heaving bars, nothing quite focuses the mind like the thought of being chased down an alley by six enormous bulls. As a loud bang indicated the release of the bulls from their corral some 200 metres uphill, the runners around me began to jockey for position – all elbows and knees – like relay runners waiting to receive the baton. Then as the boisterous, overbearing roar of the spectators indicated the rapid approach of the herd, the fight or flight instinct settled unanimously on the only sensible option… run. Except there was nowhere to go apart from forward, where hundreds of men in white shirts and red sashes blocked the path. It was a case of every man for himself. People were tripping up all over the place, creating a minefield of obstacles, and there was a sense of total panic. After 50 metres or so, I looked back to see the crowd of runners suddenly split open to reveal a truly terrifying sight. Several tonnes of horns and hooves thundered towards me, arriving at my side within seconds. As we rounded a tight chicane – the most dangerous part of the 825m run – thankfully each of the bulls stayed on their feet and nobody got seriously gored. The end result was just three people taken to hospital – all from broken bones. So important is the event to Spain that all eight consecutive bull runs are dutifully reported, at length, in national newspapers including ABC and El Mundo. 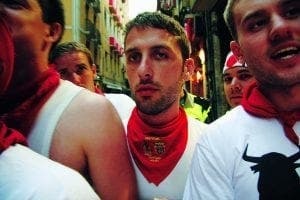 As a journalist brought up reading the likes of Orwell and Hemingway – and heavily inspired by their adventures in Spain – I had always fantasised about attending the famous San Fermin festival. It is by far Spain’s largest, and Hemingway’s book Fiesta does a great job of summing up its excesses. The adrenaline rush of the run was unbelievable and the dangers very real, but in reality the risk factor is often exaggerated. The celebrated encierro – which has taken place each July for over 200 years – is still extremely hazardous, as highlighted by the death of a runner as recently as 2009. But unlike in Hemingway’s day, the risks are carefully calculated, and managed accordingly. I had initially been part of a group in the hundreds that had been sifted from the route by a rigorous police cordon looking to dramatically reduce the volume of runners taking part. It was only by a nifty side manoeuvre, taken with perhaps just half a dozen others up a side street, that I was able to jump back into the route. These days the bulls are also guided by a group of eight to ten steers or cabestros who ensure that the animals remain on course and don’t get separated. There are also big fines of over 1,000 euros for anyone attempting to stop the bulls or doing anything unduly dangerous. The run had lasted for exactly two minutes, 58 seconds, which was in stark contrast to the arduous 12 hour mission myself and my editor had undertaken to get up to Pamplona. With all trains and buses going to Pamplona completely full, we had to find another option. Flights to all the northern Spanish cities like Valladolid, Zaragoza and Burgos were coming in at well over 400 euros return and we were adamant we did not want to undertake the 22 hour round-trip by car. So the best we could do was get a train from Malaga to Madrid and then on to Burgos, where we picked up a hire car for the remaining two hour drive to Pamplona. For those looking to follow a similar route, it’s well worth factoring in a few hours in Madrid to take in sights such as the Prado, which is very near the station (although be aware that the connecting train is from a different station Chamartin, some half an hour north of Atocha). Accommodation in the town during the festival is booked months in advance, with hotel prices often tripling. But drive just a few miles from the centre of Pamplona and you may be surprised by some of the pleasant hotels with rooms available. We stayed in Hotel Agorreta, in the small village of Salina de Pamplona, some 5km south of the city. A pretty spot, the hotel staff were friendly and helpful about logistics and we ended up getting a shuttle bus from the nearby town of Noaim, which had a cheap, efficient service taking revellers to and from the festival all day and all night at 15 minute intervals. While we had taken the last room – a double room with just one bed – it was entirely academic in the end, as we got separated and spent the entire night soaking up the party atmosphere. It is worth getting into Pamplona each evening by 9pm to avoid the arrival of the crowds. There is a fabulous 20 minute firework display every evening and there are hundreds of bars catering to the thousands of revellers. Look in any direction and you will be greeted by a sea of red and white, the traditional festival dress code. Then walk in any direction and you won’t be short of places to have fun. The whole city centre is awash with music, madness and mayhem. The hours up to the bull run are some of the most fun and frenetic I have ever witnessed. Everyone is having a good time and while it is heavily booze-fuelled, you don’t see the naked aggression or fights that you would expect to see in most towns in the UK. The local Spaniards are eager to talk and there is a large smattering of Aussies, Kiwis and Americans over for the week. Pamplona itself may be best known for the festival but it is far from a one-trick pony. While it’s difficult to take in the sights during the festival, visiting Navarra’s capital at any other time of year will allow you to explore at your leisure. The cathedral is one of the most important religious buildings in northern Spain, containing the tombs of former king Carlos III and his wife. There is also an impressive citadel to admire or you can while away the day people watching in the Plaza del Castillo. After 24 hours in Pamplona we were more than ready to escape into the surrounding countryside for some relief from the intense party atmosphere. With a hire car, we could take advantage of a journey along the celebrated Camino de Santiago south towards Burgos. The picturesque town of Estella – 50 kilometres from Pamplona – provides a great place to spend the night. A popular stop-off on the Camino de Santiago, Estella was the headquarters of the Carlists during the Civil Wars of the nineteenth century. Split in two by the River Ega, the town has a number of attractive churches, monuments and squares with guided tours in English available from the tourist office. Accommodation options are plentiful in Estella and provide a good base for wine-lovers looking to explore the excellent Navarra vinos. This part of Spain is a hidden gem for anyone looking to get off the beaten track. Heading up into the hills we found the welcoming village of Larrion, where there is a superb venta for lunch and a nearby truffle museum. Not far away was the perfect hangover cure, a trip to the source of the Ega river near the tiny village of Barindano. Here we ducked our heads under a source of ice cold mountain fresh water, before taking a short hike into the nearby hills. From here we headed towards Burgos for the long slog home. There’s no escaping the fact that the 2,000 kilometre round trip is a tiring and expensive way to visit Pamplona and with a bit more advance planning we could have done it more cheaply. But either way, as I got into my bed in Ronda after the 48 hour round trip – my shattered body aching and my brain throbbing – I could count myself lucky to have witnessed what is without a doubt one of Europe’s most exhilarating weekends of fun. But please don’t tell my mum. We have been to fiestas and towns the length and breadth of Spain over the last 7 years. Whilst your experience does indeed sound fantastic I’m not sure I agree with the whole bull-running thing at all. Each to their own. I agree with you in that we have also never seen any ‘naked agression’ etc but Pamplona (just before the runs) was by far the most disgustingly filthy town centre I have ever seen, anywhere. The impression we got was of a large number of (non-Spanish) drunks asleep in loudly waking up in the squares and under bushes surrounded by bottles, cans, vomit etc. However, remarkably the public toilets under one square in the heart of town were quite incredibly spotlessly clean and included flowers in vases ! We would love to go back and experience Pamplona again but never again in July. Now I prefer my meat on a plate, not running over me. But then I guess one has to respect other civilizations, some are more advanced some less. Its a like going to the jungle and telling natives that they should live in houses and enjoy running water and all that good stuff. The Spanish just need a little time to come up to the 21st century. Gotta have respect for the Natives and their customs. Candelaria los nativos no tormentan los animales solo los usan para comer y los respetan mucho no los usan para juegos salvajes. Duh. Yeah, like I really respect death by stoning of woman in Iran, for example. OP, please award Wellington the moron of the month award. interesting >>>> what type of juegos salvajes are you talking about ….. and los resepetan means they smoke and cuddle after the juegos savajes ? I have been to Sanfermines on a number of occasions and enjoyed it greatly. It is a fiesta and like other fiestas the encierro (the bull run) and indeed the bull fights are only a part of the fiesta. There are a mass of cultural, athletic, religious events and entertainments going on with all the local clubs going full pelt each and every night of Fiesta, indeed the main plaza, the Plaza del Castillo has a concert held in it every night. 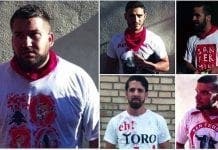 The problem with Sanfermines is it’s popularity with extranjeros, mainly young Americans, Australians and New Zealanders to whom the whole fiesta is about the encierro, the bull-fights and drinking with typical Anglo-Saxon over-indulgence. 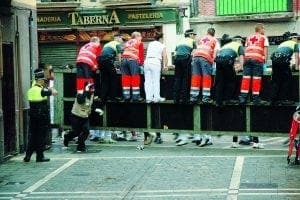 This is not how the local people from Pamplona and Navarra behave. Thereused to be a US contingent, mainly college students on vacation who had read Hemingway’s ‘The Sun Also Rises’ and when Hemingway re-visiting the fiesta in the 1950s he thought they had totally changed the nature of the fiesta. I think he was too harsh as when I first attended Sanfermines in the early 1970s it was still a local fiesda, albeit with a distinct American presence. It was James Mitchener’s book ‘The Overlanders’ published in the mid-1970s that put the fiesta on the Australian/New Zealand summer tour route. Since then every year seems to see ever larger numbers of Australians, New Zealanders and Americans attend and the fiesta has become more of a beer/wine swilling event for these young people. I saw the encierro on TV this summer and could not believe the number of runners who were before, beside and behind the bulls as they passed through the streets. The number of runners plainly needs to be controlled in some way. Indeed, that is the core problem, as a public event there is no control on who can attend Sanfermines, so the fiesta continues to decline. FRED – Exposed, for what he is. wouldn’t see irony if it sat on his face …..
Candelaria. Madre hace tiempo que murio pero ella siempre aborrecio las corridas de toros y cualquier fiesta que se hacen entretener con animales los animales no son un juego si usted cre no no cree en Dios no importa pero todas las religiones prohiben maltratar a los animales la creacion de Dios nos lo dio para podernos alimentar y no para atormentarlos, usted dira lo que quiera pero yo siempre odie las corridas de toros y cualquier fiesta que asustan y maltratan a cualquier animal. 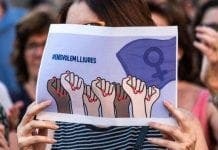 Lo siento senor o senora pero no me va ha convencer hoy dia tenemos juegos ordenadores y teatros cines a donde ir a disfrutar no es necesario tener fiestas salvajes es asi como yo pienso y mi madre y mis abuelos en fin muchos espanoles piensan como yo y ademas donde esta la ley que protege a los animales en Espana done como le digo los espanoles para me todavia siguen salvajes pero de los malos no todos pero estos que van y apoyan estas fiestas tan salvajes. perdone si le molesto pero alguien tiene que hablar por los animales porque ellos no pueden hablar por ellos solos. 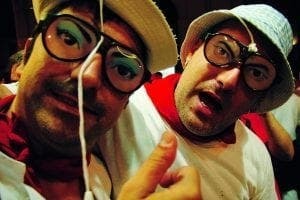 Las fiestas de San fermin son juegos usan los toros para divertirse y no se da cuenta los pobres toros lo asustado que estan a veces hasta se caen ustedes son unos salvajes de forma de utilizar los toros para fiestas o juegos. No one have the rigth to take the live the any person no mater what only God have the rigth. Can you post an the photo here with an arrow marking the spot so that we can all see please? I think you’re fibbing. Anyway, can’t you do something ‘cultural’ that doesn’t involve cajoling and annoying these animals? You might find it fun, but I’m not sure they do. Anyone who eats meat doesn’t have the right to talk about animal rights. Ever been to a slaughter house? Do you think the piggies enjoy the transport ride to the abattoir? Personally, I feel that people obsessing about animal rights while not giving a damn about millions and millions of PEOPLE in very poor conditions all over the world make me very sick! Go and hug your poor little street dog. Ooooh poor doggie!!! P.s. Fred, do you enjoy living in Spain? Candelaria. 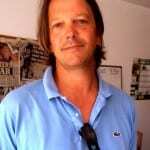 Louloudi you are wrong we care about the people in africa and i send for years money to the red cross Unifec and many charities but i steel think the animals have a rigth to be treat propelly eben when they go for sloter to feed us we mass respect then and treat with compation the are the ones they feed evey one excluding the people vegetarian, now every time you eat meat remember this animals they been kill to feet us amd the are creation the God we mass treat then with respect. Louloudi, what about a person who cares about people and animals? If we keep breeding and eating animals, and if we keep torturing and annoying these creatures for our sole amusement, it just diminishes us as the so-called intelligent beings of the planet. I gave up meat as well btw.